Blocking. Love it? Hate It? Never Heard of It? Well today, this post is for you! I’m going to teach you everything you ever needed to know about how to block crochet work. Why Block Your Crochet Work? You’ve worked so hard on your project. You’ve finally woven in all those loose ends. You sit back and admire and really…let’s be honest…you are ready to be done. And now… there’s this talk about blocking! What?! Why would anyone want to block their crochet? Well, for several reasons. First of all, blocking your crochet evens up all the edges. So if you are making afghan squares, for instance, and some turned out slightly bigger or smaller than others, you can block the squares so they are all the same size. Blocking also evens out your gauge. It defines the stitches and if the work is lacy, it can make it really stand out. If you have some sewing together to do, blocking the pieces beforehand makes them go together much nicer. It’s like this: If you are going to an interview and you pull out a dress shirt to wear. It might look just fine without ironing. But if you take that extra step, to iron it just so, it makes it look nice and crisp, neat and clean. Blocking does the same thing for your crochet. There are 3 methods of blocking crochet work: Spray Blocking, Steam Blocking and Wet Blocking. All three methods require pinning your work. The crochet piece is pinned first in the spray and steam blocking methods. With the wet method, it is pinned later. But the process is the same. First determine the size of the piece to be blocked. Then place the piece on the blocking mat. 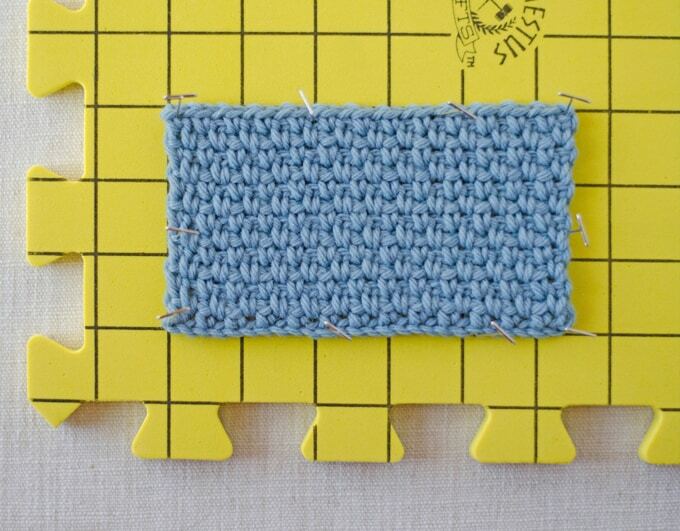 I like this blocking mat because the lines are drawn right on the mat, making it easy to line up straight edges. Then, use rust proof T-pins to pin the piece to the correct measurement. This is really important. Rust on pins can transfer to your work and then can permanently stain the yarn. 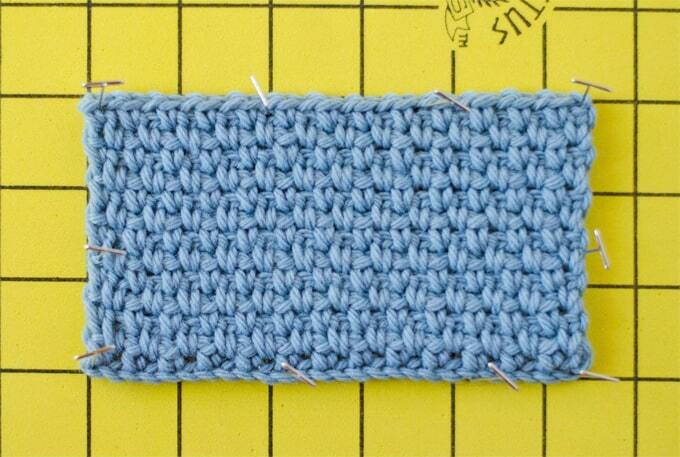 First I pin one corner, then the opposite corner, then move to a 3rd corner and the final corner. Once the corners are pinned, pin the other edges so that the piece stays in place. You may have to stretch the piece a bit to fit. Spray blocking is my favorite. After the piece is pinned, just spray all over with a spray bottle filled with water. Pat gently on the surface to help the fibers absorb the water. Let the piece dry. This can take 24 hours or so depending upon how much water you used and how much water the fibers absorbed. After the piece is pinned, use moisture and heat from an iron or a steamer. Be warned: heat can melt man-made yarn, such as acrylic and this is irreversible. If you choose to steam block, hold the iron or steamer about 1 inch from the work. With the iron so close to the work, it is easy to slip and touch the iron to the yarn–so be careful. Once the item is steamed, put down the iron or steamer and gently pat the work with your fingers to help the moisture penetrate the yarn fibers. Let dry. This process can take 24 hours or more. To wet block, immerse the piece in a bowl or sink of luke-warm water. You can add some no-rinse wool wash if you’d like. Push the piece into the water until it is saturated and leave it for 20 minutes so that the water fully penetrates the piece. Then take the piece out of the water and gently squeeze out some of the excess water. Do this until you think you can’t remove any more water, being very careful and gentle. Next, place the piece on a towel on a flat surface and roll up. Gently squeeze and press even more water out of the piece. Unroll the piece and transfer it to the blocking mat. Pin as described earlier. Let dry. This can also take 24 hours or more to dry. Learning how to block crochet work will really take your crochet to the next level! 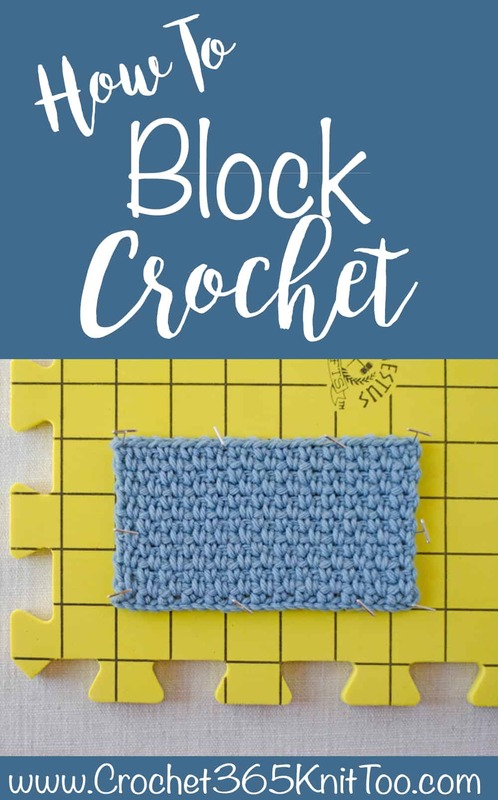 Did you enjoy learning how to block crochet work? Then be sure to check out all the other ‘how to’ crochet guides in the tutorials section of the blog. I love seeing your finished projects! If ‘How to Block Crochet Work’ worked well for you, I’d love to see your projects on Instagram, be sure to tag me @crochet365knittoo. If you are on Facebook, stop over to the Crochet 365 Knit Too Facebook page and share a photo! I’d love to see your work! I use the wet method but I machine wash my pieces at night with a little detergent. The spin cycle gets most of the water out without wringing. They are usually dry the next day if it is a small item. A scarf may take 24 hours. So far I have not had any issues. I feel like if it is going to fall apart in the wash it wouldn’t have been a good idea to give\sell it. Could you please maybe give me an idea of how to block an infinity scarf with a lacey edge? I don’t have a blocking board.